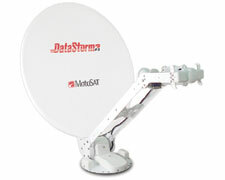 We can provide your Xcursion or Xtreme with the MotoSAT DataStorm F1 mobile satellite internet antenna. The DataStorm is the first affordable solution to meet the needs of Government, Business, Entertainers, NASCAR/NHRA Teams and RVer's that want, and need, to stay in touch when on the move. Fully automatic, this antenna will keep you in touch with mobile internet access 24 hours a day and 7 days a week when other forms of communication are too slow or unavailable. Currently compatible with the DirecWay platform, other new and exciting options will soon be released that will allow for much greater bandwidth options and speeds. 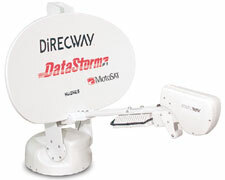 The MotoSat DataStorm F1 is powered by the DirecWay DW7700 system. The MotoSat DataStorm F1 offers download speeds averaging 400k - 600k (twice that of normal ADSL), and upload speeds averaging 38k - 52k (twice that of a typical modem connection). These systems are designed for all types of mobile use... perfect for RV's, Emergency Services and more. Once the vehicle is parked, the dish can be deployed, tuned and offering up high speed Internet access within approx. 7 minutes from anywhere in the continental U.S. and parts of Mexico and Canada that has a southern view of the sky. For more demanding uses requiring the maxium signal ratio, we offer the MotoSat DataStorm F3. This powerful commercial grade 1.2 meter mobile satellite dish is more than twice the size of the original Datastorm, but uses only 20% more roof area when stowed for travel. This rugged system can find the Direcway Satellite from fringe areas that smaller systems are unable to reach. Signal Strength and Polarization Isolation abilities are far greater than any other mobile system. This is the high end solution that assures your connection. Signal and Isolation Strength is 15+ Points over .74 Meter Dish and is Hughes' 4020 compatible. The DW7700 This is an all-in-one modem-gateway that combines receive and transmit modems with a host computer in a single box. It has receive and transmit cable connections, a power connector, and a single ethernet port. The front has a number of bright blue status LEDs. The D2 Controller This is an intelligent controller that moves the satellite dish into position, and stows it when requested.